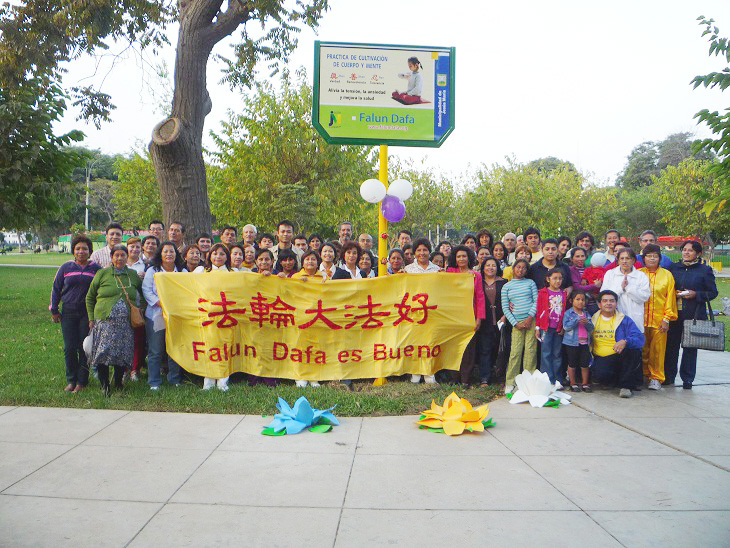 Drawing on reports from people on the ground in China, the Falun Dafa Information Center published on May 30 the details of 26 cases it had documented of the death from abuse of 26 Falun Gong practitioners since January 1, 2011. Seven of the cases include photos smuggled out of China that show signs of beating, emaciation, or hospitalization. Given the difficulty of obtaining information from China, the actual death toll is likely significantly higher. In a feature particular to the campaign against Falun Gong, several of the victims died after being held in makeshift “brainwashing centers” where torture and ingestion of unknown drugs were used to force people to renounce their practice of Falun Gong. Zhou Yongkang, who has been named in news reports as taking the lead in a recent crackdown that has seen prominent artist Ai Weiwei and numerous human rights lawyers “disappeared,” has over the past decade been intimately involved in the repression of Falun Gong practitioners. Zhou specifically named Falun Gong as a target for a pre-Olympic crackdown in which thousands of practitioners were detained. Six of them are among the list of individuals killed in early 2011. Every May 13 since 2000 Falun Gong practitioners around the world have sent greetings to the overseas Falun Gong website Minghui.org in honor of World Falun Dafa Day. The date marks the anniversary of when Mr. Li Hongzhi first started teaching Falun Gong publicly as well as Mr. Li Hongzhi’s birthday. This year Minghui.org logged several thousand such greetings from Falun Gong practitioners in China, each representing a different region, indicating the continued popularity of the practice in China despite 12 years of harsh repression. For a decade Falun Gong practitioners in China have run underground “materials sites” for the production of fliers, booklets and informational DVDs that expose the human rights abuses by the Chinese Communist Party and the misinformation used in its propaganda. Home-based sites that use low-cost but relatively sophisticated software, printers and CD burners have become increasingly efficient and numerous, with estimates as high as 200,000. Finished materials are usually delivered in person to doorsteps, mailboxes or public areas, despite the risks of arrest and imprisonment. As part of a detailed feature article on the phenomenon, Chen Pokong, a prominent overseas Chinese dissident and writer told The Epoch Times: “This is terribly significant. This method can cancel out the indoctrination by CCP-controlled television stations and newspapers.”. Working through neighborhood associates, the 610 Office in Chengdu, Sichuan province detained over 20 practitioners in April for the purposes of “transformation,” a CCP euphamism for the coercive process of forcing Falun Gong practitioners to renounce their beliefs. Many of those detained are elderly and almost all were abducted directly from their homes. Most were taken to makeshift detention centers dedicated to “transforming” practitioners, particularly one referred to as Xinlu Brainwashing Center. Family members have been denied visiting rights and neither formal charges nor release dates have been issued. This grim situation is part of a 3-year campaign to transform Falun Gong practitioners, as recently exposed in a Congressional Executive Committee on China report and reported on by the Falun Dafa Information Center starting in 2010. The names of those detained are available upon request. Evidence of cases of citizens in China being imprisoned for transmitting information about Falun Gong over the internet or via text messages continues to emerge. The Falun Dafa Information Center recently received information of two Sichuan practitioners who were sentenced to five and a half years and six years of imprisonment for sending Falun Gong-related text messages. Ms. Su Lijuan and Ms. Feng Juan were sentenced in late 2010 and their punishment confirmed in March 2011 by the Liangshanzhou Intermediate Court. The court based the punishment on a text single message that called for people to see a court case involving Falun Gong practitioners. During the hearing, one witness named Wang Chunyi reportedly said, “On April 24, 2010, I received a short message from the cell number 15520381308, stating ‘The Xichang Court will hold a hearing on two Falun Gong practitioners on April 18 at 9:00 a.m. Human rights lawyers from Beijing will defend them and plead not guilty. We encourage people to come to the Xichang Court for this event.’” As more human rights lawyers have taken Falun Gong cases in recent years, it has become increasingly common for practitioners and other supporters to gather outside the courtroom to express their solidarity. In several instances, those doing so have themselves been detained and later imprisoned. On May 4, the first lawyer in Guangdong province to defend Falun Gong practitioners in a Chinese court was put on trial. Between 2005 and 2006 Mr. Zhu Yubiao defended three Falun Gong practitioners and reportedly “left the courts speechless” as he argued successfully that the ban on Falun Gong contravenes Chinese law. After defending Falun Gong practitioners in court Mr. Zhu became a practitioner himself. He subsequently had his law license taken away and was imprisoned in a re-education through labor camp from February 2007 to April 2008. He was detained again without charges on August 18, 2010 and held at Haizhu District Detention Center. The outcome of the May 4 trial is not yet known. A Beijing civil rights lawyer who disappeared in April 2011 has been returned to his hometown, though he remains extremely weak. According to sources inside China, Mr. Jin Guanghong can vaguely recall beatings, being tied to a bed and force feedings. He also recalls being injected with unknown drugs. But details such as when he was abducted, specifically where he was held or even the faces of those around him while detained are foggy. Mr. Jin became a lawyer in 1996. He started defending Falun Gong practitioners in 2008. His abduction is part of the current wave of arrests of civil rights lawyers and others vocal about human rights that started in February 2011. On May 13, 1992, in a humble schoolhouse in northeastern China, Mr. Li Hongzhi began teaching Falun Gong (or Falun Dafa), introducing to modern China a practice with roots extending back thousands of years. 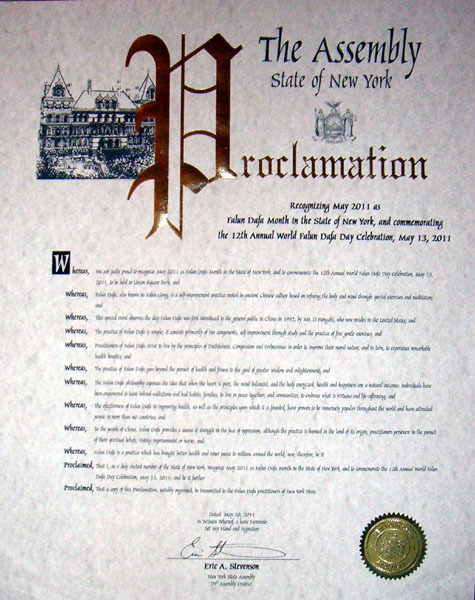 To celebrate this day, 19 years later, millions of Falun Gong practitioners around the world – in over 100 countries and speaking at least 30 languages, held public demonstrations of Falun Gong’s exercises as well as artistic performances such as song and dance, giving thanks to Mr. Li for his teachings and the goodness they have brought to people’s lives. An Ontario-based human rights tribunal ruled on April 27 that a Chinese Seniors Association violated the law by discriminating against a 78-year-old Canadian citizen who practices Falun Gong. The Association was ordered to pay Ms. Huang Daiming $15,000 in damages for revoking her membership and demeaning her faith. “I find that this comment [‘evil cult’] constitutes discrimination within the meaning of the Code,” wrote tribunal vice president Michele Flaherty in the decision. “The comment had the effect of demeaning the complainant and affronting her dignity on the basis of her creed.” The importance of the victory lies in providing leverage for other Chinese communities in Canada to resist CCP pressure to extend the persecution of Falun Gong overseas. 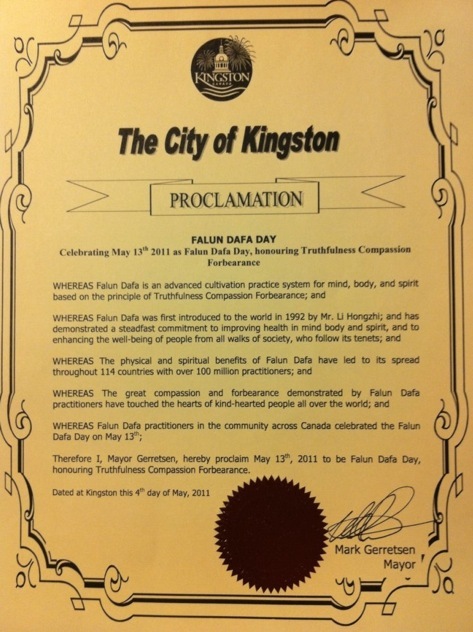 A celebration for World Falun Dafa Day and the anniversary of the Indonesian city of Surabaya in mid-May ended darkly when police dispersed a Falun Gong parade and attacked at least four reporters. NTD footage shows a practitioners being aggressively forced inside a truck where a policeman beat him. 21 police are now under investigation according to the Jakarta Times. The East Java Police spokesman told the Jakarta Times that local authorities are restricting Falun Gong activities because of requests from the CCP officials. The International Federation of Journalists also reported on the incident.